Another straight choice to end the week. 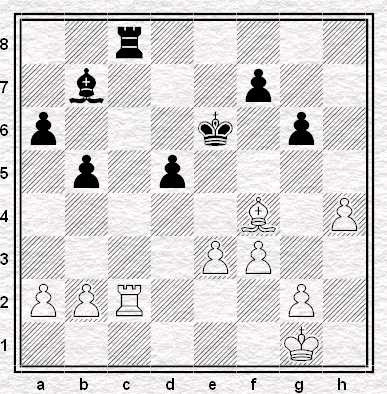 White's a pawn up and is looking to win the game, but what is the best way to proceed? Moving the rook away surrenders control of the c-file yet exchanging leads to one of those notoriously drawish - even more so than rook endings - opposite coloured bishop endings. I would exchange the rooks - looks like the white king can penetrate the dark squares on the queenside and potentially create a passed h-pawn. Yes,I agree - Rxc8! Black will have to sac his d-pawn to prevent the White King getting to d4 after which the threat of creating a passed h-pawn,a 2 pawn advantage and play on both sides of the board will win easily. You both have it - or at least you both agree with Capa. I'll have to make the next one tougher. If I recall correctly, you also wanted to avoid the piece trade in Blue/Red 1. It's opposite colours, but one of the bishops is pretty bad.